1. 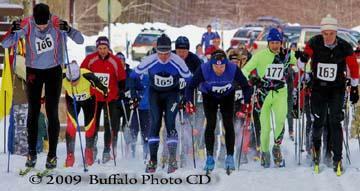 A large, long distance cross country skiing event. 2. Any long endurance race or athletic event which occurs across varied terrain. Join XC skiers from Western New York, Western Pennsylvania, and surrounding areas on the beautiful Art Roscoe Trail System of Allegany State Park. Choose from one of three different Classic XC race course distances – 6K, 13K, or 22K – whichever suits your ability or desire! After getting in a great workout enjoy the post-race party to include lunch and door prizes.